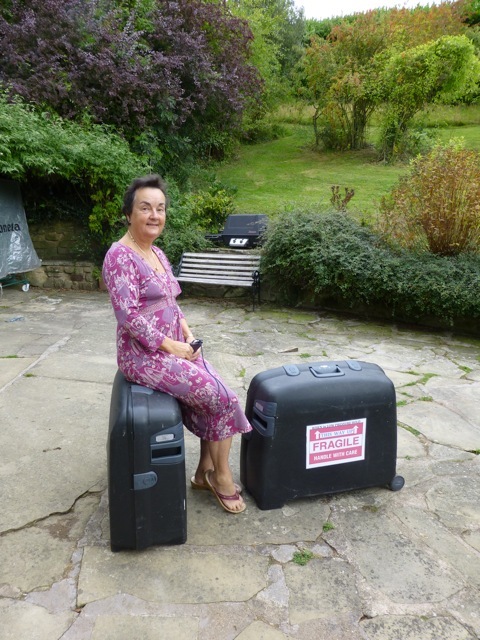 Richard and Anne Lewis regularly travel with their tandem and were strong advocates of our designing a separable version of the Helios. 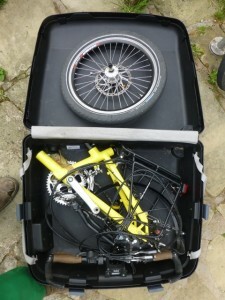 This article is about how they fold their separable Aurora tandem into two suitcases for flying. 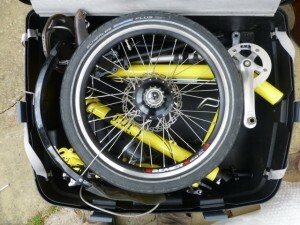 There are various one and two case, or bag, solutions that people use for transporting the Helios, but, as there are likely to be two people travelling with a tandem, a two case solution works well, keeping the weight of the individual cases down and allowing smaller cases or bags to be used. 1. Rear triangle, separable parts and front wheel in one case. 2. Front triangle, seat posts and saddles, and Rohloff rear wheel into the second. 3. Advisable to remove both chains. 4. Use padded wheel bags. 5. Rear mudguards can stay in place. Front removed and put in wheel bag. 6. One front brake (the Lewis’s have two) removed to go with the rear triangle. 7. Forks removed. This is dependent on the size of the cases used and is not necessary with the single case pack using our Traveller case.